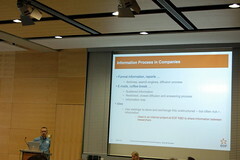 Now to the 3rd panel with some more about corporate applications. Using weblogs for sharing informal information; problems with folksonomy like variation and ambiguity; tags with concepts. First of all it’s important to know, who one’s users are and what they want. Social software could also be used as some kind of pre-first-level IT support with a very low entry barrier.